Only 5000 boxes were made, harvested from the best tobacco of the 2003 crop, the Gran Reserva signifies the best possible product from Cuba. Here’s more about this special smoke: Habanos Press release. I couldn’t pass up the opportunity to smoke a cigar of this magnitude, even at nearly a dollar per millimeter of tobacco. As I take it out of my trunk humidor, I can’t help buy notice how unassuming it is. The wrapper looks like any other Habano, light brown and thin with very little visible veins – just a little more red in color. I expected it to be more hefty than it is, most Cohibas are packed very tightly, but not this one. Upon clipping it, I notice the pre-light draw is very easy – different from most Sig VIs. I toast the foot and begin to draw in the best that Cuba has to offer. Aaaah, one of my favorite cigars. If only all toro were made this dense and full of flavor! Has 4 years slowed this freight train of flavor down? We shall see! This came from a box of 10, and i have been waiting to try another for quite a while. A dress box of Partagas Lusitanias magically appeared in my humidor a while back, and I thought it would be a good idea to check on the box to see how these Lusis were aging, as I plan on going at least five years on these. I love Partagas Shorts. These tiny little flavor bombs always seem to deliver. This came from I box I have been putting away for a few years. This stick is almost three years old, and it has been a while since I have checked on it. The wrapper has a lovely reddish hue, that hints at a richness below the surface. It took a light easily, but the pre-light draw was a little tight. Right off the bat I can tell that it has lost some of the spiciness with just a few years of age, but in this case the change was OK. Party Shorts can be hit or miss but this is drawing nicely after the first quarter of an inch. This cigar has a leathery and woody tobacco core with just a little less spice than a “fresh one”. This is another size that I have been meaning to try for a while. The Cubans make good little cigars that are often much more tasty than their fatter big brothers. The wrapper is a bit interesting; it is a little darker than your standard Havana wrapper. This might indicate a rich little flavor bomb! The draw is very nice, much easier than the Sancho Panza Molinas I had earlier. It took light nicely and unloaded a rich black coffee and a musky earthiness on me from the first puff. The burn was dead even and it delivered consistent voluminous plumes of smoke. Don’t forget folks that the Diplomaticos line is basically an inexpensive Montecristo as the blends are almost identical. My only complaint is that because it is so short, my fingers started burning a lot quicker! 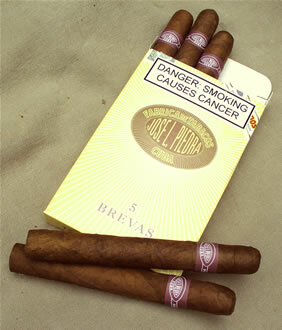 This is Cuba’s version of the bundle cigar. NOT known for their consistency, JLPs are super cheap and have mixed filler. Please don’t use this to form an opinion of Cuban cigars. I could barely draw from it, it was so tight. As far as flavor is concerned this has a bit of the cuban muskiness and there also is a touch of tobacco. I barely got any smoke out of this, and I had to give up or my cheeks were going to implode. JLP are very hit and miss; some are okay this one is not.